In 1905, T. Rex was named as the largest predatory dinosaur ever found, & for whatever reason became so popular in society that for some people the name T. Rex is synonymous with the word dinosaur. But 90 years later, a larger charcharodontid, Giganotosaurus carolinii, was discovered, & has not yet even come close to T. Rex's fame. Giganotosaurus was unearthed by an amateur paleontologist working in Argentina. 70% of the fossil was complete, enough to show it was the largest predatory dinosaur found so far. It is estimated the original animal was 50 feet long, 8 more than T. Rex & weighed 8 metric tons, 2 more than T. Rex. 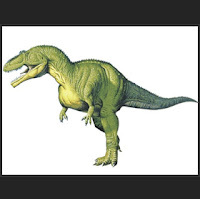 Giganotosaurus was however more slender than T. Rex, & almost certainly preyed on larger animals. The evolution of Giganotosaurus' family, the Charcharadontosaurs, was either a response to the evolution of giant Titanosaurs such as Argentinosaurus, or the other way around where larger carnivores forced sauropods to enlarge to survive.